These photographs show Virgil "Zeke" Barnes from Jackson County, Kansas. 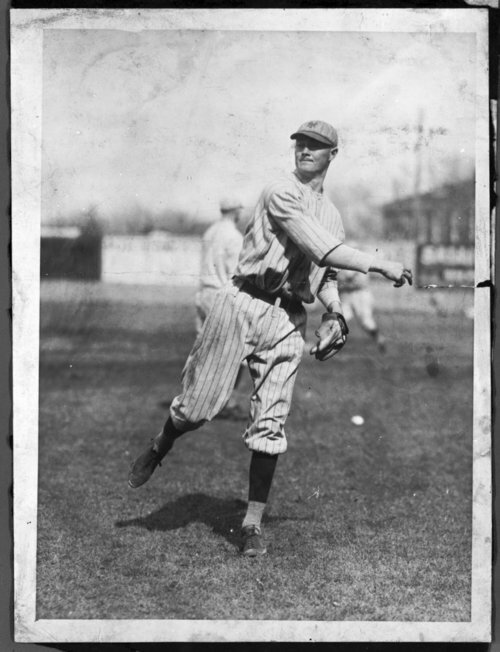 Barnes was a right-handed pitcher who played seven complete seasons at the major league level, primarily for the New York Giants. He had 61 major league wins, with a career ERA of 3.66. His best year was 1924, when he had an ERA of 3.06 and a record of 16-10. Barnes made World Series appearances in 1923 and 1924, including the starting assignment in Game 7 of the 1924 World Series. Barnes' older brother, Jess, also was a major league pitcher for several years. Two younger brothers, Charles and Clark, received pitching tryouts with major league teams but did not make their rosters. Virgil Barnes was born in Ontario, Kansas, in 1897 and was raised in the nearby community of Circleville. He married Della Barnes, also of Jackson County, in 1920. The couple made their off-season home in rural Jackson County. In the mid-1930s, Virgil, Della, and their two children, James and June, moved to Wichita. Virgil lived in Wichita until his death in 1958. Both he and Della are buried in the Holton Cemetery. In 2011, Virgil Barnes was inducted into the Kansas Baseball Hall of Fame. These photographs show Virgil "Zeke" Barnes from Jackson County, Kansas. Barnes was a right-handed pitcher who played seven complete seasons at the major league level, primarily for the New York Giants. He had 61 major league wins, with a career ERA of 3.66. His best year was 1924, when he had an ERA of 3.06 and a record of 16-10. Barnes made World Series appearances in 1923 and 1924, including the starting assignment in Game 7 of the 1924 World Series. Barnes' older brother, Jess, also was a major league pitcher for several years. Two younger brothers, Charles and Clark, received pitching tryouts with major league teams but did not make their rosters. Virgil Barnes was born in Ontario, Kansas, in 1897 and was raised in the nearby community of Circleville. He married Della Barnes, also of Jackson County, in 1920. The couple made their off-season home in rural Jackson County. In the mid-1930s, Virgil, Della, and their two children, James and June, moved to Wichita. Virgil lived in Wichita until his death in 1958. Both he and Della are buried in the Holton Cemetery. In 2011, Virgil Barnes was inducted into the Kansas Baseball Hall of Fame.